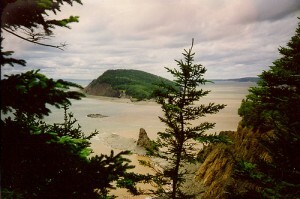 View of the Bay of Fundy from Five Islands. The cliffs of Five Islands Provincial Park rise 90 meters over the Bay of Fundy, making it a must-stop spot for wonderful water views as you travel between Parrsboro and Truro. The setting is dramatic. Cliffs tower over the sea bed. From here, you can watch the world’s highest tides come in and out. As the waters recede, walk along the ocean floor and see what surprises mother nature has left behind. An hour or two will be enough for a picnic and a short stroll but you can also spend a few nights camping, hiking, rockhounding and kayaking or try your hand at clam digging and then eat the fruits of your labour around the evening campfire. There are over 70 campsites plus picnic areas, an unsupervised beach and a playground. Facilities are open only in summer but the park remains available for people to visit year-round. Directions: It’s well signed on Route 2, about 60km from Truro. If you’re coming from the Trans-Canada Highway, Exit 4 in Amherst, Exit 5 near Springhill and Exit 11 at Glenholme will all link you to Route 2. Open: Mid-May to September Contact: For reservations, call 1-888-544-3434, Monday to Sunday, 9am to 11pm.